Converts Word 2007 .docx files to RTF files. Is there a better alternative to docXConverter? 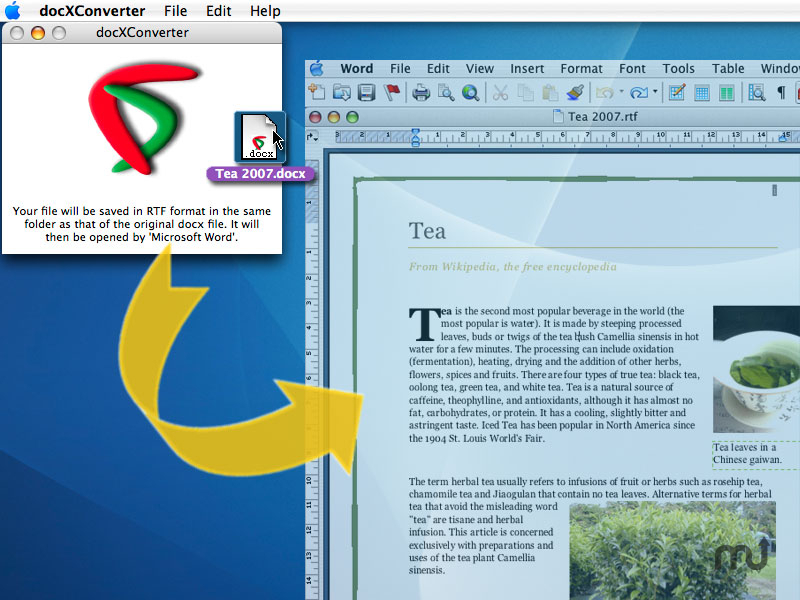 Is docXConverter really the best app in Word Processing category? Will docXConverter work good on macOS 10.13.4? Brings support for OS X 10.8 Mountain Lion and OS X 10.9 Mavericks. docXConverter needs a rating. Be the first to rate this app and get the discussion started! docXConverter is a program for opening and using files saved in the new Word 2007 default format, docx or in the new Excel 2007 default format, xlsx. docXConverter allows you to open docx or xlsx files with a program currently installed on your computer, even if none of your programs are capable of doing so on their own. For a docx file docXConverter converts the file to an RTF file, and then instructs one of the programs on your computer to open that file. For a xlsx file docXConverter converts the file to a CSV file, and then instructs one of the programs on your computer to open that file. docXConverter makes sure that the contents, the graphics and the layout of the original docx document are kept in utmost fidelity. Use docXConverter to open docx files in a word processor not compatible with Word 2007, to import docx files to a desktop publishing or graphic program or, if you are using an email program for example, use docXConverter to open docx files in text format. Use docXConverter to open xlsx files in a spreadsheet not compatible with Excel 2007, or to import xlsx files to a database program. docXConverter is available for $19.95. docXConverter Premium, which includes a maintenance plan of two years of updates and upgrades, is available for $29.95.